The Kitchen is no doubt the busiest part of the house, full of activity each day. But making your luxury kitchen in India attractive is the sure way to go this season after all a hint of style does make your ordinary workplace interesting! The trick is to make your luxury kitchen in India efficiently stylish. Although the luxury kitchen trends in India come and go, there are a few kitchen styles that are timeless. In addition, the new styles in design like the open kitchen layout and German and Italian modular kitchens etc, while also meeting the trends of time has made contemporary kitchens efficient as well as nonetheless appealing. Here are a few luxury kitchen ideas that take the best of both timeless styles and the contemporary designs to make your kitchen efficiently trendy! In the contemporary kitchen in Delhi, Mumbai or any other city, especially in the open kitchen layout the main highlight is the standout kitchen island. It is the focal point of the kitchen where almost all the essential work takes place. These islands not only feature cooking units like gas stoves, microwave etc but also are equipped with bar-stools, sink, retractable venting and other options of functionality that make it a multipurpose platform. This versatile kitchen design for a modern space is equipped with drawers for storage, the sink and a cook-top and can be incorporated into any kind of even existing kitchen design. Such a standalone island the rest of the space revolves around it. Such modern kitchen islands are very stylish often crafted with materials that are good-looking, durable and easy to care for. Granite is a kitchen slab/countertop material used that gives a timeless feel to the kitchen. Granite comes in pretty, natural tones that have the capacity to complement the kitchen interiors. It is the natural essence of granite that is the highlight of the kitchen interior décor. Innovative lighting goes a long way in making a luxury kitchen in India stylish and trendy. They are the new alternatives in kitchen design, especially because the focus is no longer on the, from the top to bottom, but lighting up lower functional spaces, like drawers that lit up when opened. Often lighting under cabinetry is design features that make up for a modern visual display. Ceiling lights especially focusing on the kitchen island in an open kitchen layout are the standard lighting choices otherwise. Neutral colors are universal and classy and balance the home interiors. Adding muted greens and blues also work as neutrals for the kitchen space. Colors can be matched up with the kitchen upholstery to give a fairly attractive look. The modern kitchen appliances and cabinetry come in a host of colors which combined with earthy colored hardware give a dramatic effect. Smart and innovative storage options are a timeless trend that not only saves space but also are the key elements of a modern modular kitchen. The kitchen needs a lot of storage space and with a great priority on storage, a smart option often works wonders. It makes the kitchen more organized with cabinets especially making up for a defining feature of a kitchen. Wine storage space in the kitchen is a sophisticated and attractive affair. The bottles of vintage can be stylishly displayed in a wine chiller in India that adds to the charm. From the stainless steel sink to dishwashers, a hint of steel in the kitchen is a classy style call that adds an earthy feel to the kitchen outlook. It gives the kitchen a sleek look other than being hygienic and withstanding the wear and tears of time. These kitchen design elements are universally timeless and the application of them can transform an ordinary kitchen space into a modern and stylish entity. 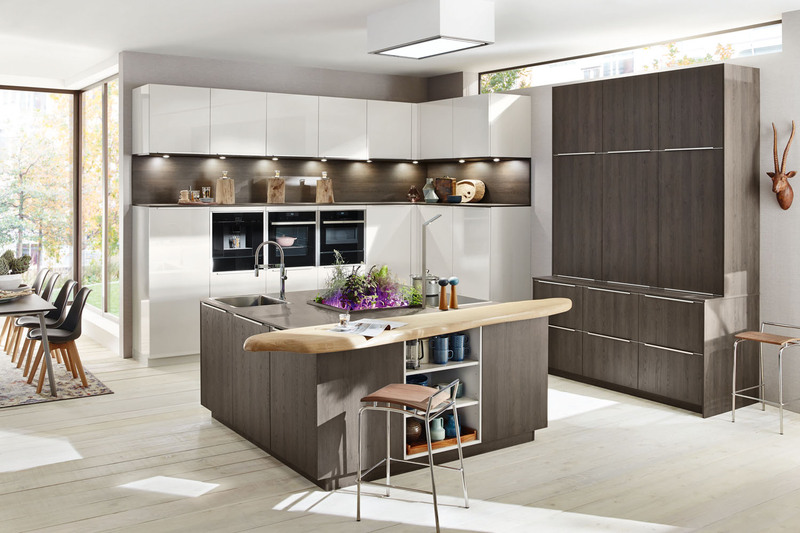 The luxury kitchens in India especially imported kitchens in Delhi, Mumbai or other cities from leading brands like Ballerina Kuchen India come in attractive styles with such kitchen trends already incorporated. Whether it is the best modular kitchen in Mumbai or other styles of Italian kitchens in India or even the best German kitchen in India, you would be spoilt for choice.